Tea has had it's part to play in history and in literature. And being that I love books and children's literature, I couldn't help but make the next set of dolls following this theme of tea time. Whether in the adult world or in a child's world, there is often much more brewing than tea at teatime. At our house, we like to play tea time a lot. It's been at tea time when I've learned about many stages of emotional development happening with my 3-year old daughter. 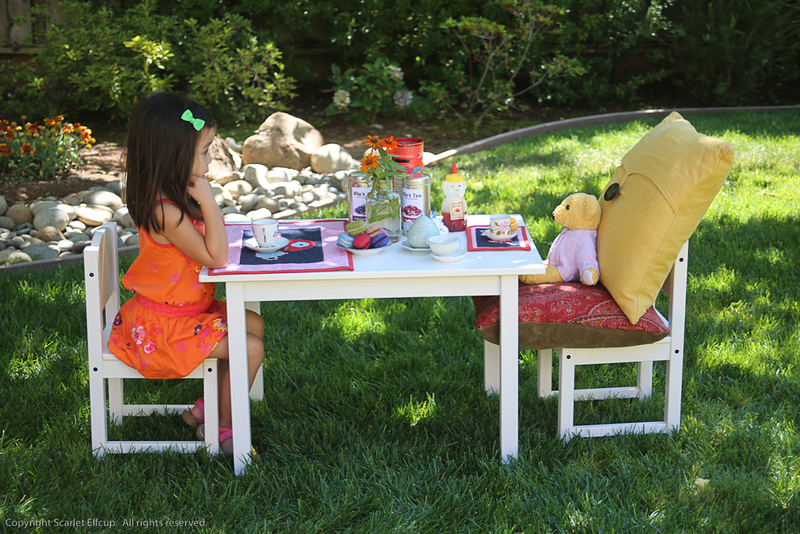 At tea time, we often sit with one of many friends and discuss all sorts of topics...from how her day went at school to what each of her animal friends like. Today, we had tea with Bob, the bear. Bob likes to wear pink sweaters and it turns out Bob likes a lot of pink things. That's the beautiful thing about a child...to my daughter pink means nothing more than just that...a color. It can be worn by bears, male or female. For us supposedly older and wiser adults, who have our opinions and biases to bring into much of what we see and hear, pink is categorized as something for only females...unless you are in the world of fashionable men...then, pink is ok. I am not so sure how to encroach upon this topic with a 3-year old...this topic of why being a princess is really not all that. I am not graceful or tactful about these sort of things sometimes. And I'm not so sure I should even address it at all because after all she is a 3-year old who just wants to be a princess. So, why can't I just let it be? But, I don't just let it be sometimes. So, today at tea time with Bob, the bear who loves to wear pink sweaters, we talked some about princesses and fairies and ballerinas. I asked my daughter what she likes about a fairy, what a fairy does, why she would want to be a fairy. And how about a ballerina...what do ballerinas do, what is it that makes her someone fancy. And then, how about the princess...what do princesses do, what do you like about a princess, why you want to be a princess. Turns out that fairies have magic wands and wings that make them fly and it would be fun to fly. And a ballerina has pretty shoes and she dances and dancing is fun. And a princess...well, she didn't know what a princess does or even what she likes about the princess. It also turns out that being a robin (as in the bird) is also nice because one can fly high in the sky and that would be great fun. So, we left the conversation at that. But, that was our tea time conversation. For her, it was child's play, we are pretend playing. The three of us talked about ballerinas, fairies and princesses. For me, it was a way to understand my child, a way to help me process my stubborn adult biases and learn how to let go of all my ideas about how I want to raise my children. And so, we came to no conclusion about the princess. But, yet, I feel better for having talked about it. And tomorrow, perhaps she will still go running around shouting, "I'm a princess. I'm a princess." And I will cringe once more at hearing those words. But, for today...we had tea with Bob, the bear in a pink sweater. Form has been deleted. The recipient of this giveaway has been notified. Thank you for your participation. 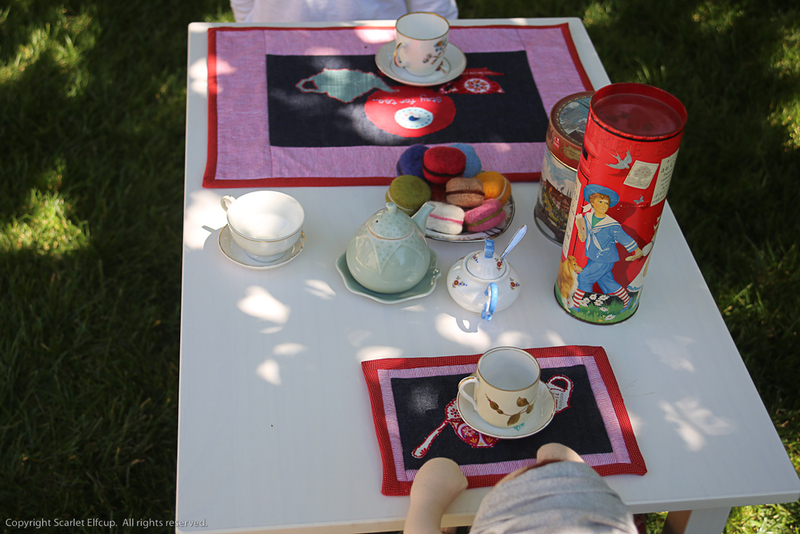 A handmade placemat set for you and your doll. The life sized placemat measures approximately 13" x 18". The doll sized placemat measures approximately 6" x 9". Quilted and padded with 100% cotton batting. The back of the mat is a beautiful cotton flower print.